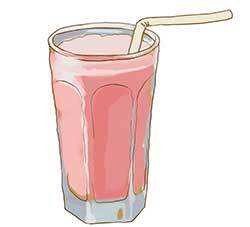 The dairy cow does double duty in the creation of a milkshake, first as the starting point for the ice cream, and second as the fountainhead for the milk. 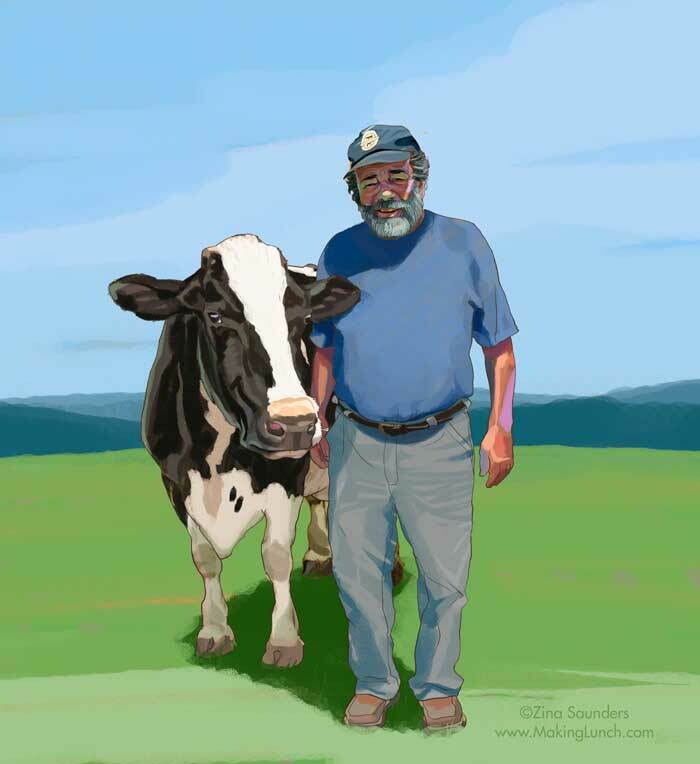 But cows are more than placid dairy machines, according to dairy farmer Ron Osofsky, age 65. He says that cows have lots of different personalities, and he treasures them all ... even the sneaky ones. “I loved growing up on a farm. There were always things to do, and I never thought twice about working. I loved doing hay, I loved driving tractors … and I started when I was real little. I started on horses, doing hay, when I was about four years old. I thought I was driving them, but I’m sure they were doing their own thing. And then I graduated from that to a truck, at about the same age, and I couldn’t reach the pedals, but I was in there, steering it myself, so I thought I was King Tut on the mountain. My brothers and sister, we all of us loved the farm, growing up. We still love it now, but there’s so many easier ways to make a living! “All my animals are like pets. I’ve had favorite cows, all along. I actually had a bull, Hearty, that I grew up with, that I used to play with. I would take him all over the place. I’d put him on a halter and we’d run through the fields. But in a couple of years he got big, but I didn’t get that much bigger. I mean, he got real big. And he had horns, and one day, when I was 12 or 13 years old, he caught his horn in my coat pocket, picked me up in the air like a little rag doll, and tossed me up and down a few times. He was just playing but he could have killed me. And my father came home and he made me tie him up and he cut his horns off. “You know, cows are very friendly. They’re very playful when they’re little, and they’ve all got different personalities. Some of them are skittish and run away from you in the beginning, but if you spend time with them, they get friendly. “And some of them are sneaky. The men don’t like the ones that know how to open up the door and sneak out or go into the grain bin and steal the grain, but they’re the ones I think are clever, that are able to do that kind of stuff, even though they are a pain in the neck! “I don’t know how intelligent they are, but they know where their own stalls are, and they learn that very quickly. We even had a blind cow that knew where to go! I don’t know if she counted her steps or what. She was something. We had her for about 10 years. “They live 12, 13, 14 years. Most people keep them … well, the average age of cows is only four, because people don’t keep them. Ours are much older. The veterinaries, they’re not as expensive as doctors, but they’re very expensive, so a lot of people, when the cows get sick, they don’t keep them any longer. A lot of time, we spend money on the veterinarian when we should’ve let the cow go. My wife thinks it would be more compassionate to put them out of their misery, but I think, if I have a chance to live, I want to live! I relate it to myself. Some cows really try hard and they come back; other cows give up... they just don’t have a strong constitution. “Cows are social; they break up into groups, into cliques. I don’t know what they’re discussing, but they tend to do that. And it’s always the same ones that seem to be the leaders. In the milking herd, it usually just divides into a couple of groups. But the heifers? They break into smaller groups. Like teenage girls! “Some of them are crazy! We’ve had cows we named Crazy, because they’d kick at you. Really, its one thing for them to kick, but it’s another thing when they try to get you when they kick! Some of them actually aim at you! We had one we called Killer. But we’ve always kept them anyway. “Cows are very curious. When one gets loose, you put something strange down, and they come to investigate. Like, as a way to lure them in, I used to go and lay down in the middle of a field and pretty soon they’d all come to investigate. “Or else, when a cow has a baby, they hide the baby, so you try to make noises like the baby, so the cow will come to look where her baby is. You have to make a pretty good imitation, though, or it doesn’t work.